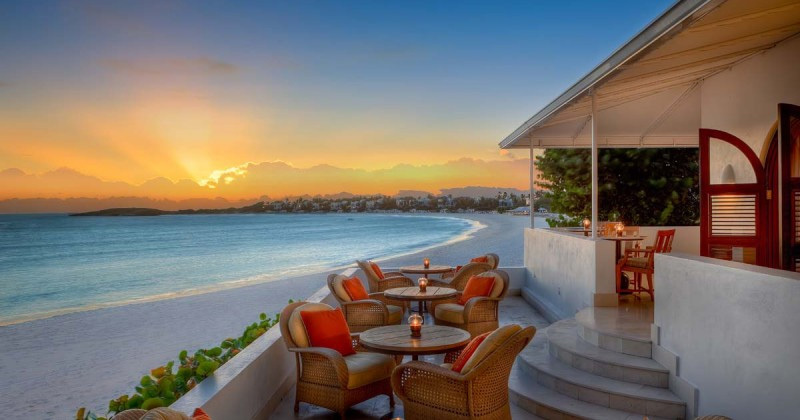 Cap Juluca is a luxury 5 star resort on the Caribbean island of Anguilla overlooking the mountains of St. Maarten and only seven miles away. 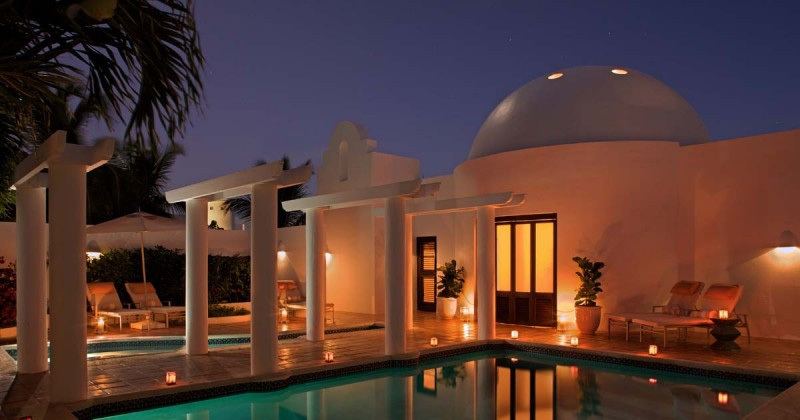 Cap Juluca is perched on 179 acres of land and inland waters. At Cap Juluca, you come to a place where sand, wind and water blend seamlessly with world-class dining and the friendliest most welcoming people of the Caribbean. 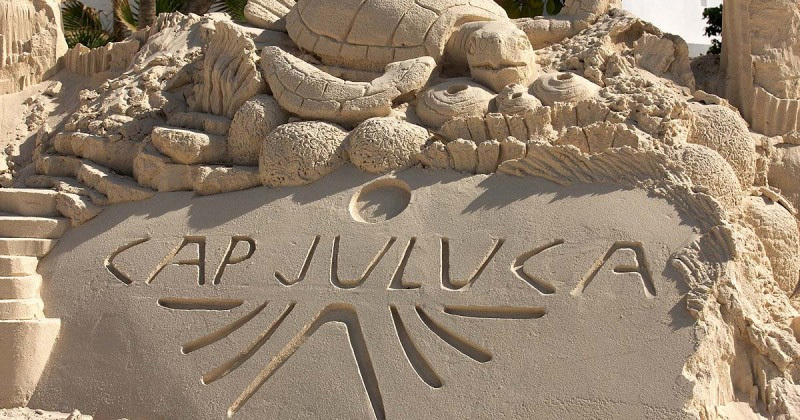 The next time you seek the sun, let Cap Juluca’s genuine staff create for you a timeless memory. The Sferra bed linens imported from Italy, are said to be the most luxurious in the world are cool and delicious when you slide between the sheets for a really good nights rest away from the everyday challenges of life. Each suite has a fully fitted kitchen. They say romance was invented in The Caribbean and perfected at Cap Juluca. Stay in a Superior Room, Luxury Room or Junior Suite with a 5 star romantic greeting. 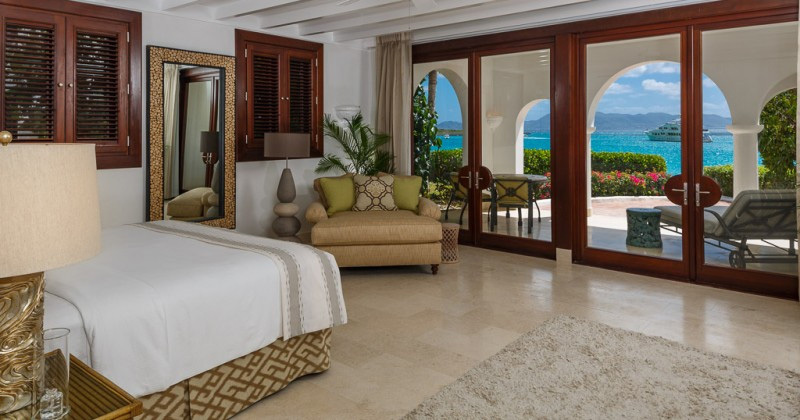 At Cap Juluca you can choose from a selection of luxury accommodation options consisting of bedrooms, Junior Suites or Villas all with louvered plantation shutters leading on to a patio or balcony with oceanfront views. Marble bathrooms and fantastic state of the art room amenities, which will tempt you to stay inside until of course you experience a heavenly day on our incomparable, glorious crescent shaped and very long palm fringed beach frontage. 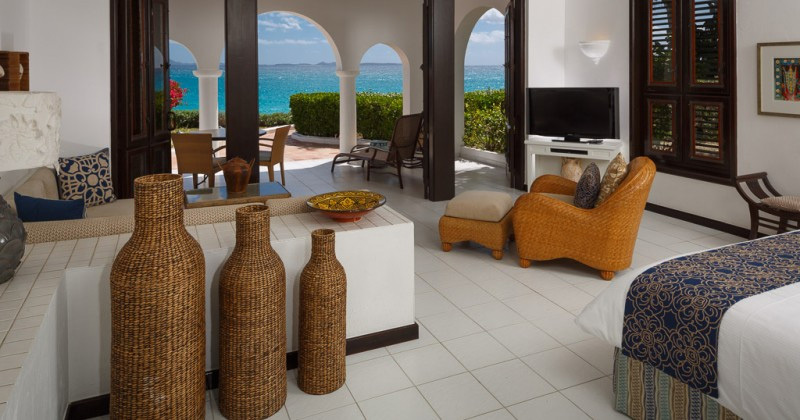 From re-envisioning every guest room, to reconstructing the Main House into the new social centre of the resort, to the placement of 60,000 new flowering plants, the look of Cap Juluca is both refreshed and rejuvenated. Our guestrooms all now feature luxurious new Stearns and Foster beds and Frette linens, 40” Sony Bravia HDTVs and DVD players, Bose Wave stereos with iPod docking stations, free wireless internet as well as enhanced patio furniture, new towels and new robes. Our world famous powdery white sand beaches have been enhanced with the addition of fashionable custom made chaise lounges. 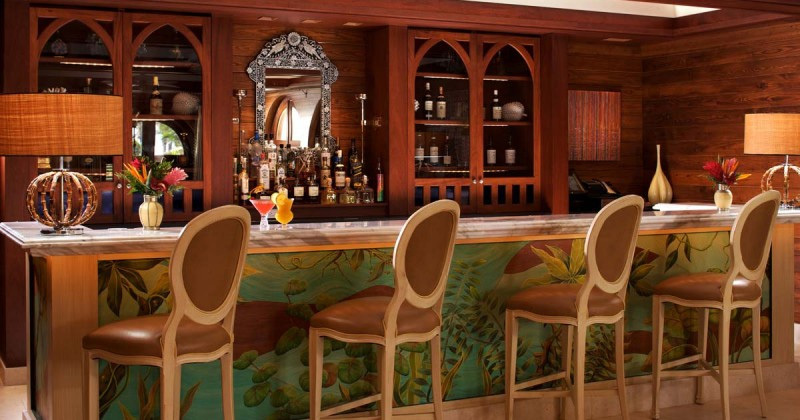 Oceanfront settings, Moroccan décor, Impeccable service and enticing menus … the culinary experience at Cap Juluca is one of international inspiration blended with the flavors of the island. Fresh ingredients will be the calling card of each dish created at each of Cap Juluca’s restaurants with a garden-to-table approach for most every herb and spice. One taste of our cuisine and you’ll admit that Pimms, Spice and Blue are not only among the finest restaurants you’ve ever experienced throughout the Caribbean, but that they are among the finest restaurants you’ve ever experienced, period. Pimms – A blend of European and Caribbean flavors (Wine Spectator’s 2011 Award of Excellence). 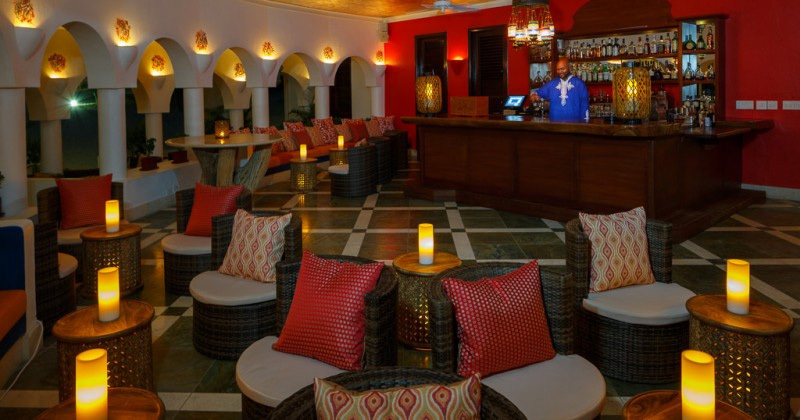 Spice – A popular bar offering entertainment with a Caribbean casual flair. Blue – Freshly-prepared beachfront dining. Maundays – Beachfront sophistication with live entertainment. Private Beach Dinners & In-room dining available. Daily activities are many and varied. 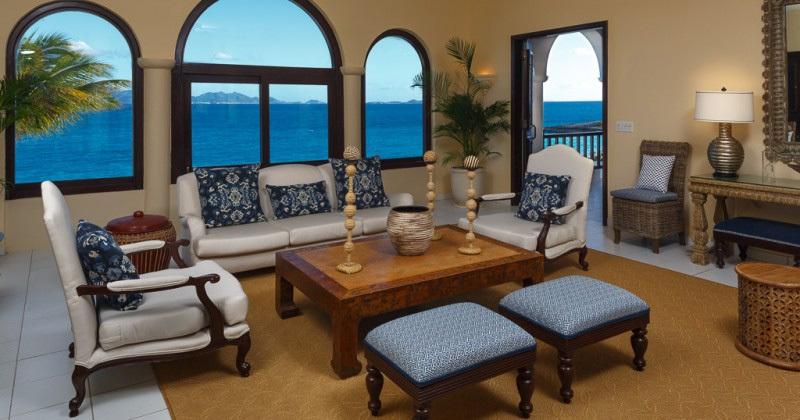 Cap Juluca now manages the 7,063 yard Temenos Golf Course, which was designed by Greg Norman and has spectacular views of St Marteen and other islands. The challenging fairways and greens will test even the most determined of golfers with perilous drops, salt water lagoons, sand dunes and deep bunkers making for a very memorable Caribbean Golf Experience. The fitness rooms are well equipped for all to use with treadmills, bikes and elliptical trainers, personal trainers are available as is Pilates, Yoga and Beach body sculpting classes daily with excellent instructors. There are tennis courts for day and night usage and classes or clinics daily. Watersports are non motorised and beach life is a never dull with an amazing 5 cabanas encouraging you to stop and chat to the bar tender on lazy afternoons, Pre programmed iPods with over 300 tunes are available to aid enjoyment of the custom designed beach chaise lounges with enormous umbrellas for shade. Tennis, Watersports, Spa, 5 restaurants and bars, Kids programme Internet and TV centre. Pool, Spa, Golf Course, Fitness, Pilates, Yoga. Beach services include ice-cold towels, sorbets, pre programmed Ipods with over 300 tunes. Library with DVD and CD. Day trips to St Marten and St Barths are great fun and provide the opportunity for some great shopping. Children will be well looked after with a supervised activities program. The library contains a selection of more than 2000 books and 1000 Dvd’s plus 4 computer stations. If you are planning on returning you may like to join the Julucan Society making you part of a select group of international travelers who will benefit from a loyalty rewards programme enhancing your next stay with added benefits. 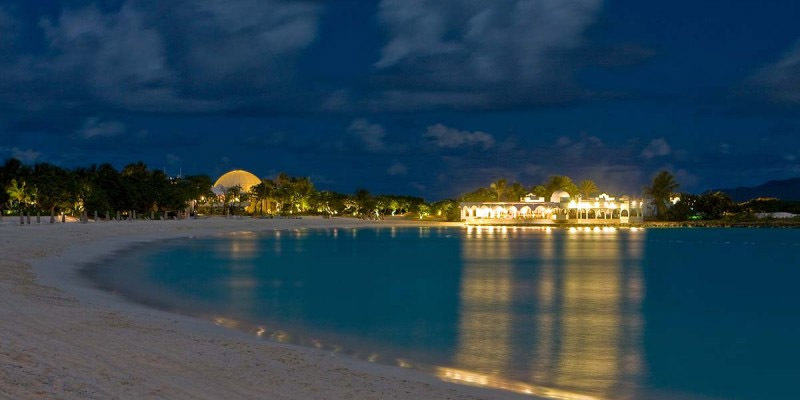 For over 20 years Cap Juluca has been a very popular destination for weddings. 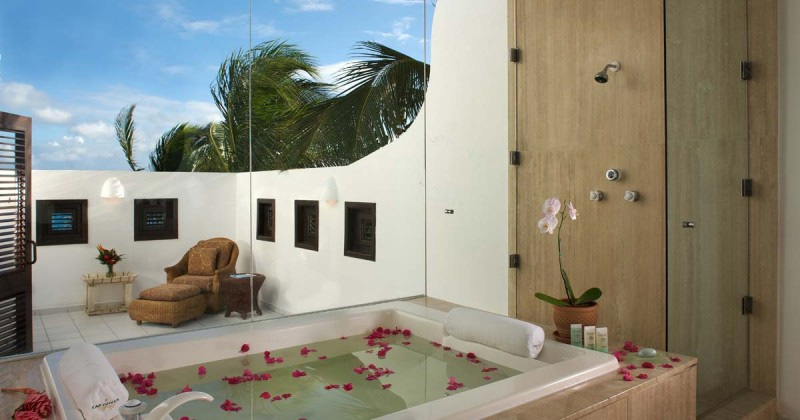 Destination Weddings featured Cap Juluca as having one of the “World’s Ultimate Bathrooms”. Recent press includes features in Brides, Bridal Guide, Grace Ormonds Wedding Style, Destination Weddings and Destination Weddings & Honeymoons. 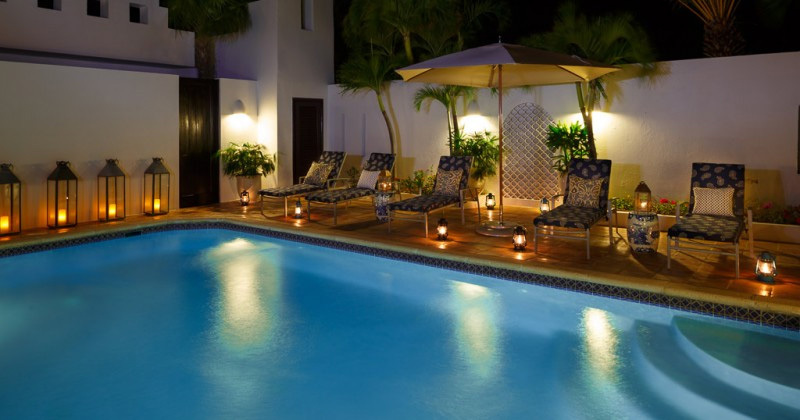 As your wedding hour approaches, relax with a couple’s massage on the privacy of your secluded terrace. Then our beautician will arrive to prepare the bride for the ceremony with manicure, pedicure, hair and makeup services. Supplied with a bridal bouquet and groom’s boutonniere, you’ll meet at a bamboo structure decorated with white fabric and flowers of your choice on the ‘beach or our wedding lawn. As the moment arrives, our guitarist will herald your arrival to the wedding and accompany the ceremony with soft romantic music. Once you are married, toast to a long life and happiness together with LP champagne, then our photographer will capture memories to last forever. After the ceremony, a romantic table on the beach with tiki torches and your own private server await to serve your selected three-course menu accompanied by a fine bottle of wine. Finally, enjoy a wedding cake for two and a turndown amenity in your room. 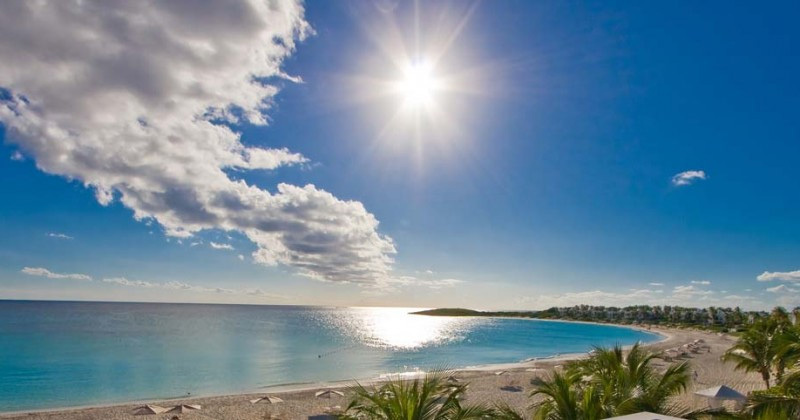 For over 20 years Cap Juluca has been a very popular destination for honeymoons. 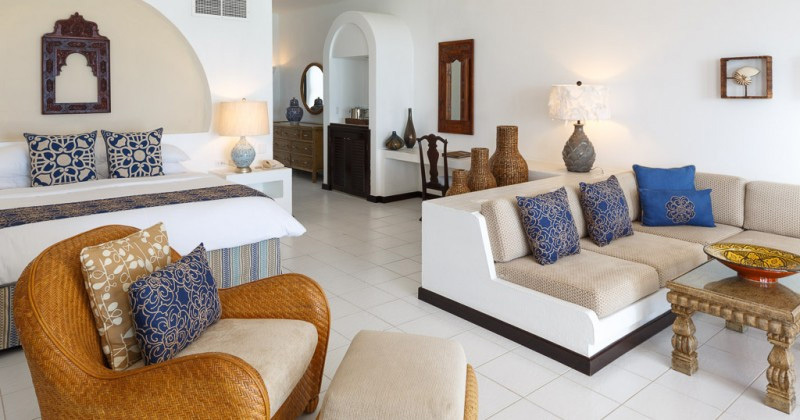 Trip Advisor named Cap Juluca as “One of the Top 10 Celebrity Honeymoon Hotels“. 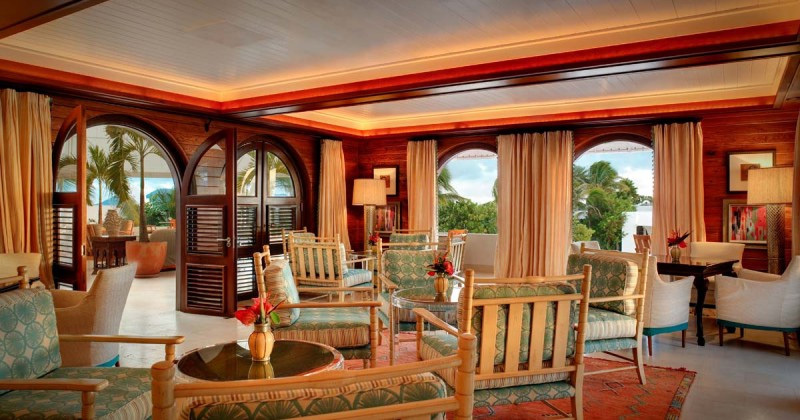 Just this year Conde Nast Johansens selected Cap Juluca as the “Most Romantic Hideaway“. Brides magazine just named Cap Juluca as the 2012 #3 Top Resort in the Caribbean for Honeymoons.